MS can take a toll on mental sharpness. Some people may find it takes longer to solve problems. Others may have mild memory loss or trouble concentrating. Most people with MS also experience some loss of bladder control, because signals between the brain and bladder are interrupted. Finally, fatigue is a common problem. You may feel tired even after a good night's sleep. In people with MS, the body's own immune system attacks the tissue surrounding the nerve fibers in the brain, spinal cord, and optic nerves. This covering is made of a fatty substance called myelin. 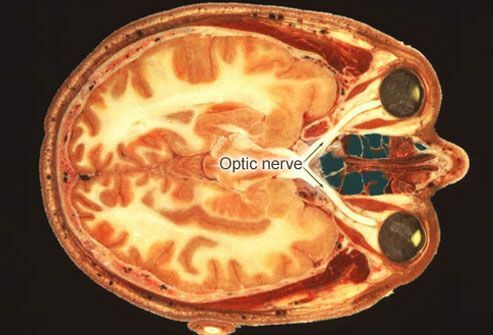 It insulates the nerves and helps them send electrical signals that control movement, speech, and other functions. 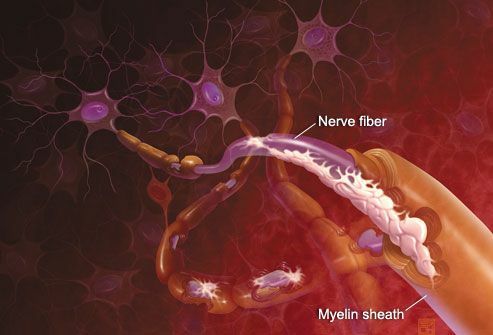 When myelin is destroyed, scar tissue forms, and nerve messages are not transmitted properly. 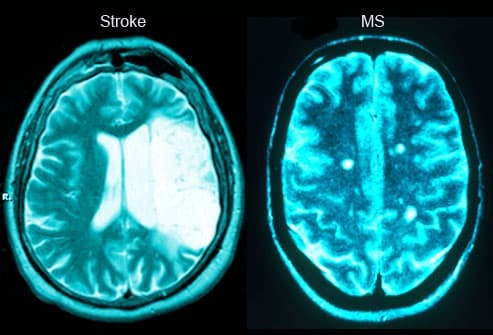 The roots of MS remain mysterious, but doctors see some surprising trends. 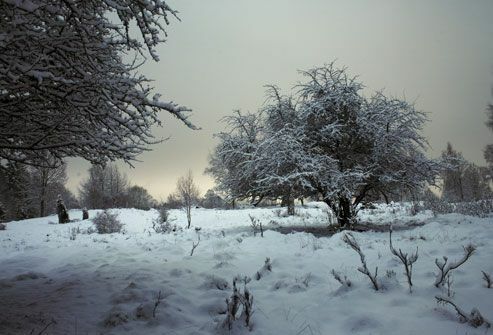 It's most common in regions far from the equator, including Scandinavia and other parts of Northern Europe. These areas get less sunlight, so some researchers believe that vitamin D (the "sunshine vitamin") may be involved. Research suggests a possible link between vitamin D deficiency and autoimmune disorders, but studies are ongoing. Genetics appear to play a role, as well. Relapsing-remitting: Symptoms flare during acute attacks, then improve nearly completely or "remit." This is the most common form of MS. 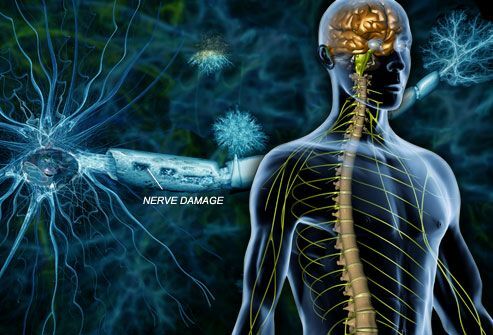 While there is no cure for MS, there are "disease-modifying drugs" that can reduce the frequency and severity of MS attacks. Use can result in less damage to the brain and spinal cord over time, slowing the progression of disability. When an attack does occur, high-dose corticosteroids can help cut it short. 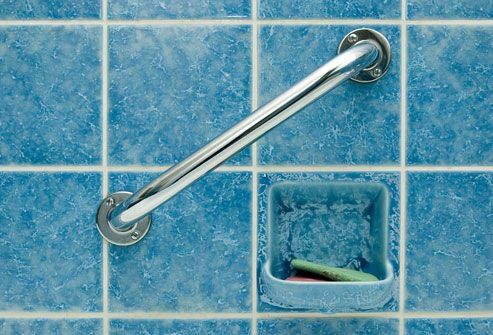 Many drugs are also available to manage troubling MS symptoms, such as muscle spasms, incontinence, and pain. 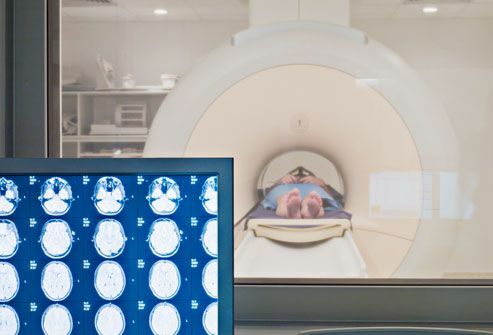 About half of people with MS develop some form of pain, either as a result of a short circuit in the nervous system or because of muscle spasms or strain. 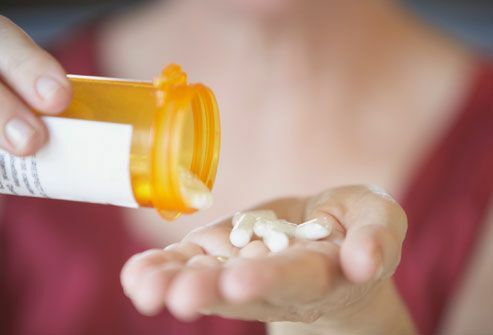 Doctors may prescribe antidepressants and anticonvulsant medications to ease nerve pain. Pain medicines and anti-spasm drugs may also be used. Muscle pain often responds well to massage and physical therapy. Be sure to discuss the options with your doctor if you find yourself in pain. If MS affects balance, coordination, or muscle strength, you can learn to compensate. Physical therapy can help strengthen muscles, combat stiffness, and get around more easily. Occupational therapy can help retain coordination in your hands for dressing and writing. And if you're having trouble speaking or swallowing, a speech therapist can help. Many nontraditional therapies for MS have not been well studied. 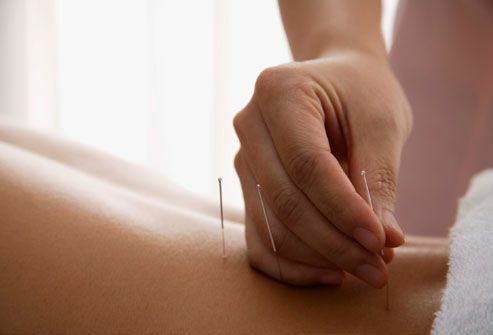 Some people say acupuncture relieves symptoms such as muscle spasms and pain, but research to confirm its value isn't conclusive. Others have reported benefits from injections of bee venom, but a rigorous study, lasting 24 weeks, showed no improvements in disability, fatigue, or the number of MS attacks. It's important to inform your doctor about any supplements, special diets, or other therapies you want to try. Doctors generally agree that it’s safe for women with MS to get pregnant. 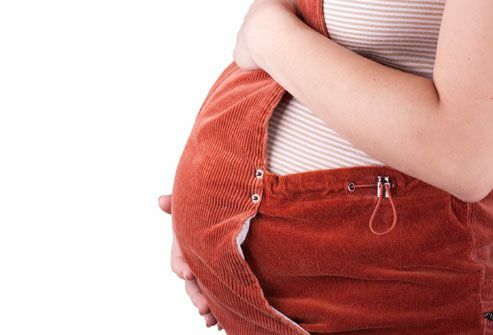 Research suggests no increased risk of complications during pregnancy. In fact, many women have fewer MS symptoms during pregnancy. High levels of hormones and proteins may suppress the immune system, reducing the odds of a new attack. It's best to talk with your doctors before pregnancy, as certain MS drugs should not be used while pregnant or nursing. In the early months after delivery, the odds for a relapse can rise. Exercise can ease stiffness, fatigue, and other symptoms of MS. But overdoing it could make things worse. It's best to start slowly. Try exercising for 10 minutes at a time, then gradually working your way up to a longer session. Before you begin, check with your doctor about what type of activity and level of intensity would be most appropriate. 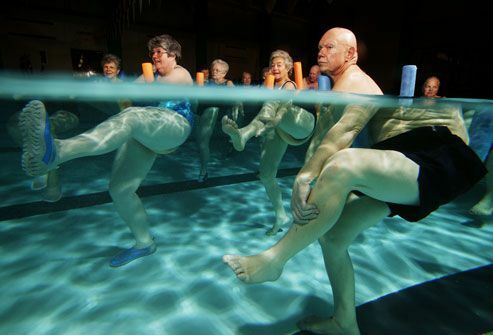 A few possibilities include water aerobics, swimming, tai chi, and yoga. 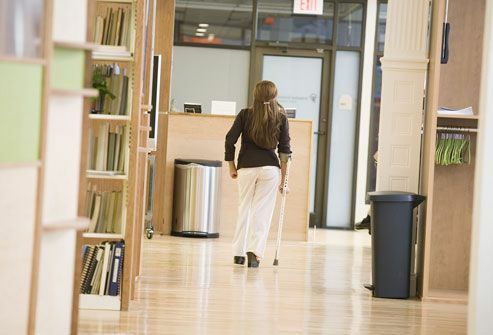 Most people with MS live a normal or near-normal lifespan. 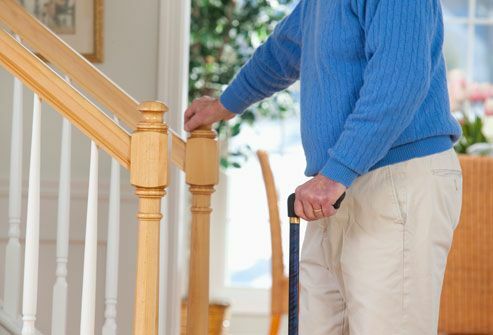 While the condition may make it more difficult to get around or complete certain tasks, it doesn't always lead to severe disability. Thanks to effective medications, rehab therapies, and assistive devices, many people with MS remain active, stay in their jobs, and continue to enjoy their families and favorite activities. George Kraft, director, Multiple Sclerosis Rehabilitation, Research, and Training Center and director, Western Multiple Sclerosis Center, University of Washington, Seattle. Francois Bethoux, MD, director of rehabilitation services, the Mellen Center for Multiple Sclerosis Treatment and Research, The Cleveland Clinic. Franklin, G. Neurology, Nov. 18, 2009. Kathleen Hawker, MD, assistant professor of neurology, University of Texas Southwestern Medical Center, Dallas. Kelly, V. Neurology, Nov. 18, 2009. Multiple Sclerosis Foundation web site. National Multiple Sclerosis Society web site.